Local Authorities such as Bolton Council have a strategic responsibility for reviewing land availability for development to support both economic activity and population growth. They are obliged to adhere to national planning guidelines, and in doing so will consider impact on the locality and the views of local people. Councillors, as elected representatives, act as the voice of local residents. Lobby groups and individuals can also influence decisions and policy. Generally, there is an expectation for there to be a 5-year supply of building land. Planning permissions now have a 3-year window in which work must be started. Housing demand is affected by the ups and downs of the economy - in a downturn developers may sit on land or sites with permission in the hope that prices will appreciate; they can also stifle supply to maintain price levels. In Westhoughton, the post-2008 dearth of building after the credit-led boom of 2003-2007 period which prompted the 'credit crunch' and recession was noticeable - sites with planning permission were not developed or put to other uses. Sites with planning permission - even outline planning permission - increase in value considerably. 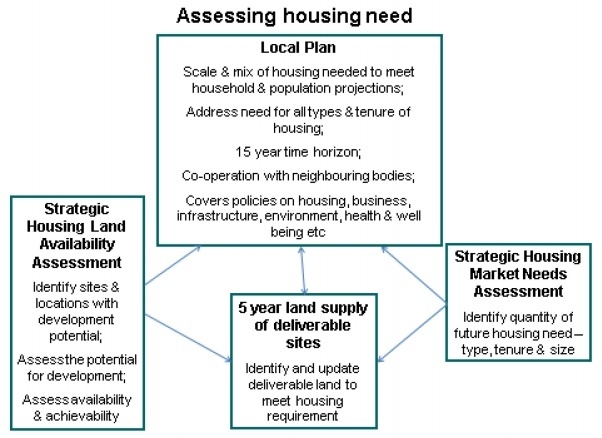 In the past a sequential test applied whereby sites were prioritised to make sure those with existing planning permission (or brownfield sites) were developed first before new sites could be added to allocations. The planning process ensures that there is some consistency and clear objective to development. The Unitary Development Plan of the 1990s, was superseded by the Local Development Framework which was further reviewed to become the Local Plan - through these planners attempt to foresee the future. Economic cycles, population growth and the whim of government policy make this changeable and hard to predict. 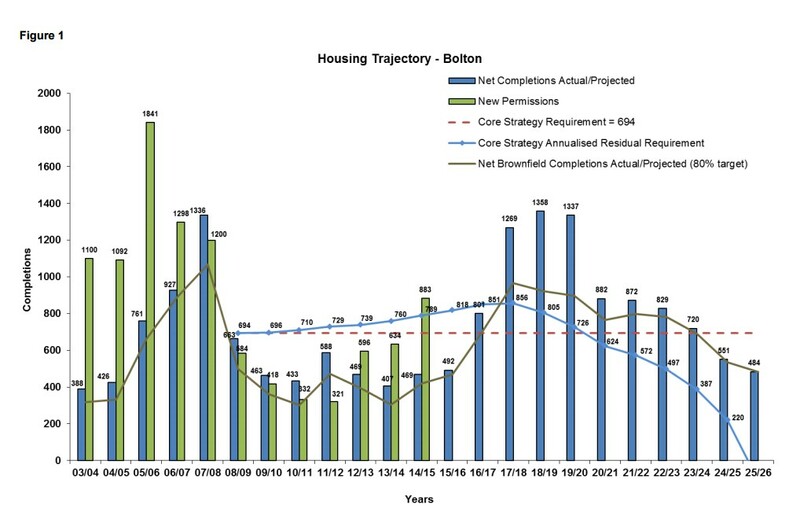 The chart below shows Bolton's past performance and anticipated performance in housebuilding across the borough - completions, new permissions (approved planning applications), brownfield performance (80% target) and residual provision against the Core Strategy (Local Plan) target of 694 dwellings per year. It clearly shows the impact of the recent recession on completions (builders stopped building), but anticipates a pick up in future years with targets being met over the plan period. Sites that are allocated on a strategic plan, or are windfall, brownfield sites will likely be approved. Councils are able to negotiate for compensation through The Community Infrastructure Levy / Section 106 money to ameliorate any detrimental impact or insist on local access improvements. Unfortunately, the big money needed for wholesale infrastructure improvements to help accommodate development is harder to find. As such, areas such as Westhoughton can see a lot of new housing but without the infrastructure and services to support it. A useful tool in keeping up to date with planning activity is the Bolton Council Maps 'My Bolton' tool on the Council website. It does take a little navigation… Go to 'My Maps' tab. Zoom in and move map to Westhoughton, switch on 'planning' in the categories and applications will be shown. Can be looked at by year. Gives planning reference and a pop up about the application, etc., which can be followed up here (enter reference / other details into search box).